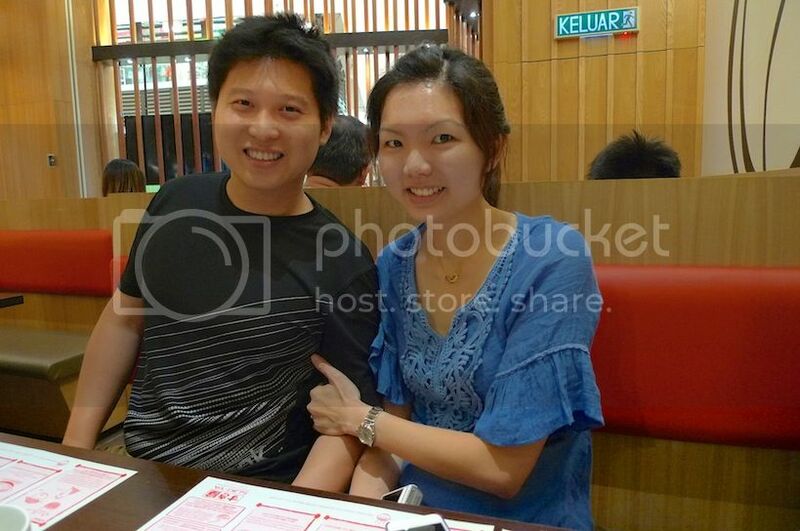 On the first day of 2013, I went to Suki-ya at Paradigm Mall for a steamboat buffet lunch reunion with my blogger friends. I could not make any reservations as I was told it was fully booked so I decided to try my luck and go there as early as possible at around 11am. I was the indeed the first customer on that day as the restaurant was empty. Quickly, I asked for a table for five people and was shown to this table. 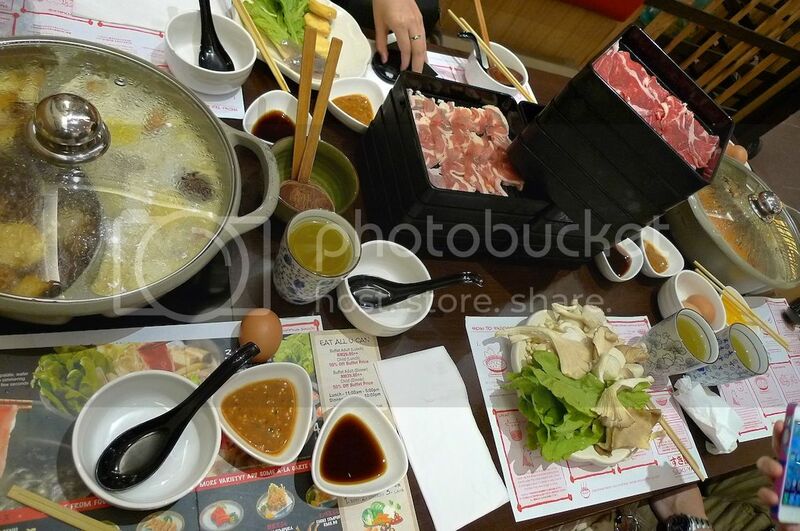 Suki-ya is an ideal place to eat all you can sukiyaki and shabu-shabu. However, you can also order from its a-la carte menu, which include food like salmon sashimi, tempura, unagi, shisamo, gyoza and edamame to name a few. 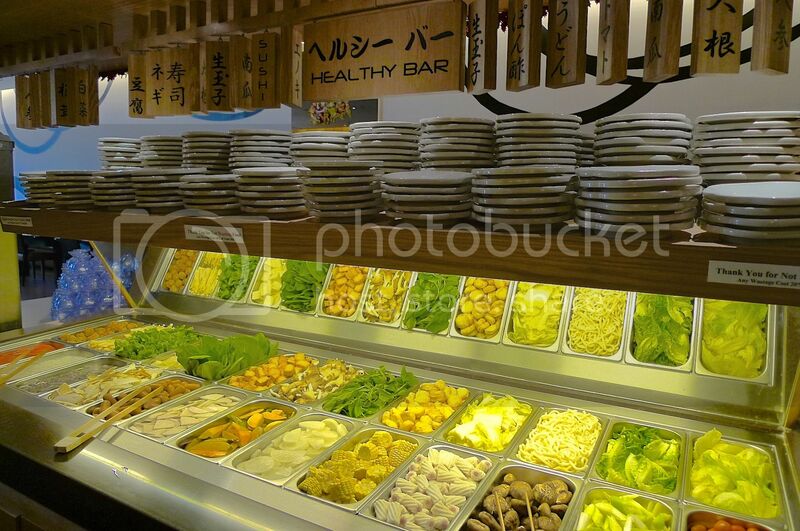 In the middle of the restaurant stands the Healthy Bar where you can take all the vegetables that you like! They have quite a wide selection of greens. 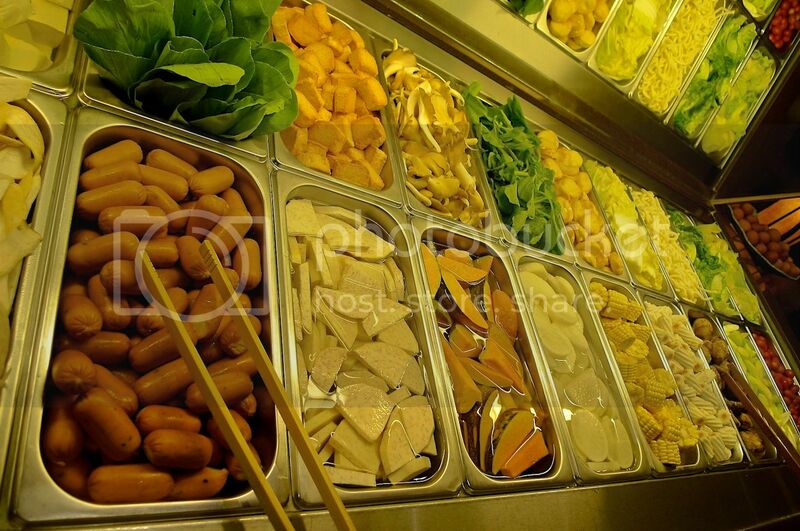 I also saw tofu, pumpkin, mushrooms, sausages and some vegetables that I did not know the names to! 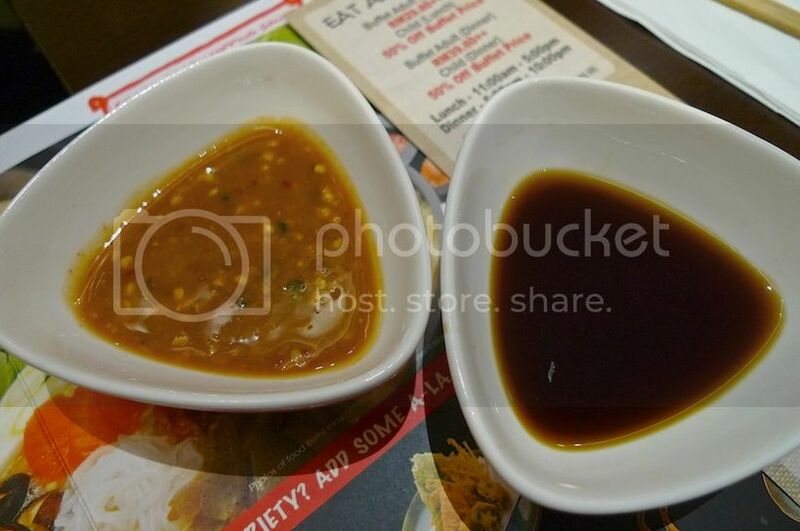 Three different types of sauces to choose from. Besides these, each person is also given two special sauces which I shall mention later. 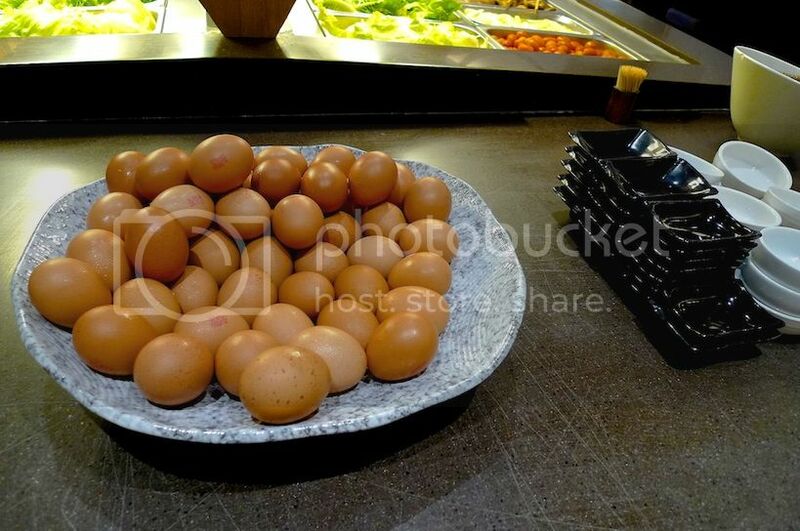 They also offer fresh pasteurized eggs to be used as dipping sauce for the cooked meat. 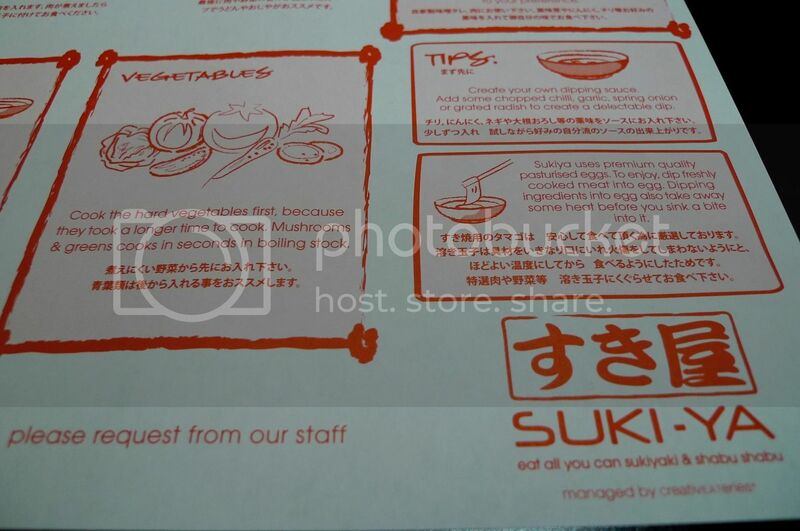 On the table in front of every seat is a piece of paper with excellent information on how to enjoy your sukiyaki to the fullest. If you are new to this kind of dining, this can prove to be a very handy guide. Three different types of meat to choose from - beef, lamb or chicken. You can choose all three of course and they can be replenished unlimited number of times. It's a eat-all-you-can buffet after all! For pork lovers, sorry no pork here. I guess it's a halal restaurant? The meat were very thinly sliced. Look! 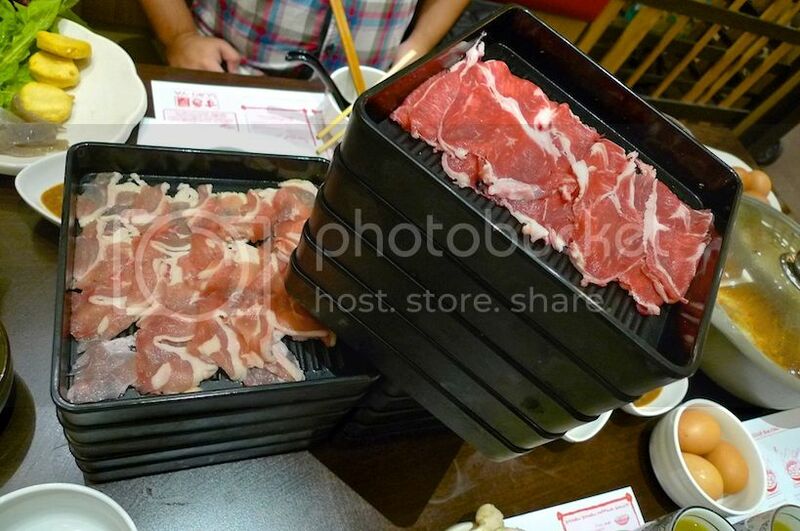 We were given 5 trays of each meat stacked on top of each other - and we could not finish them all! 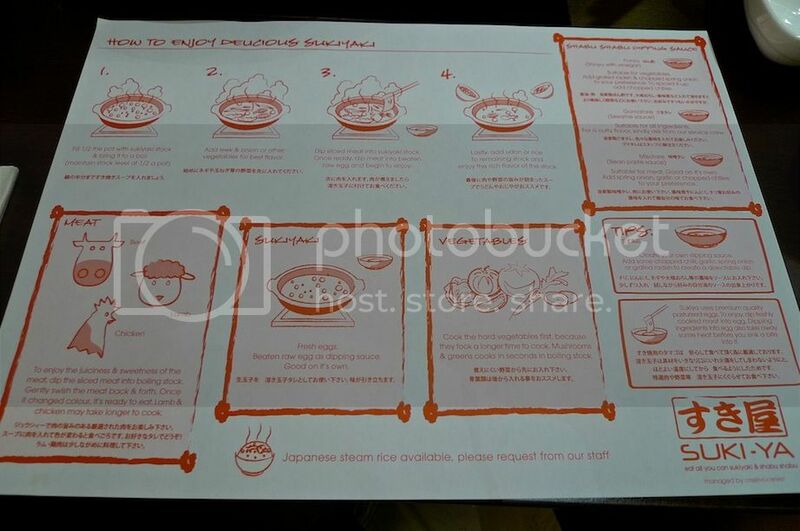 There are four different soup bases to choose from : shabu-shabu, sukiyaki, miso soup and kimuchi. 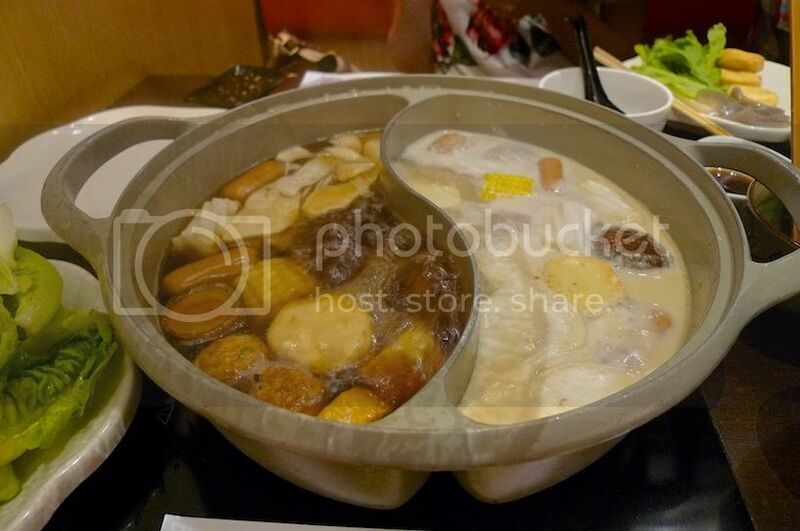 Each hot pot has two sections so you can have two different soups. 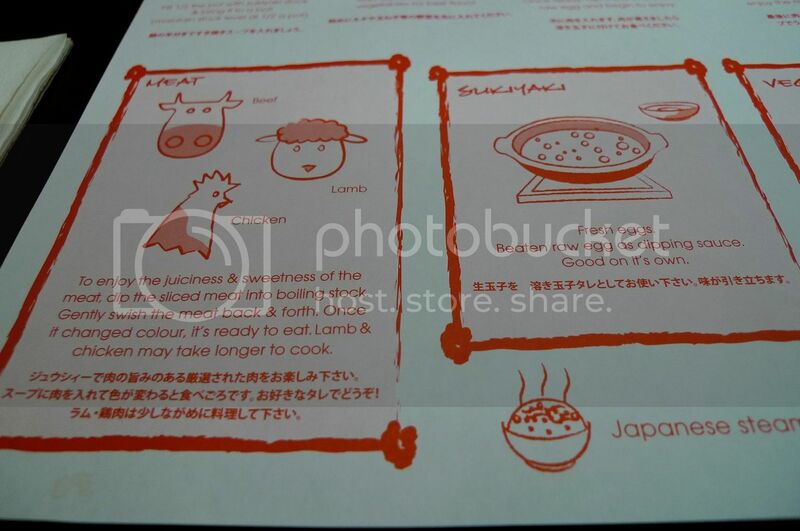 My favourite is sukiyaki! So I chose sukiyaki and miso soup. 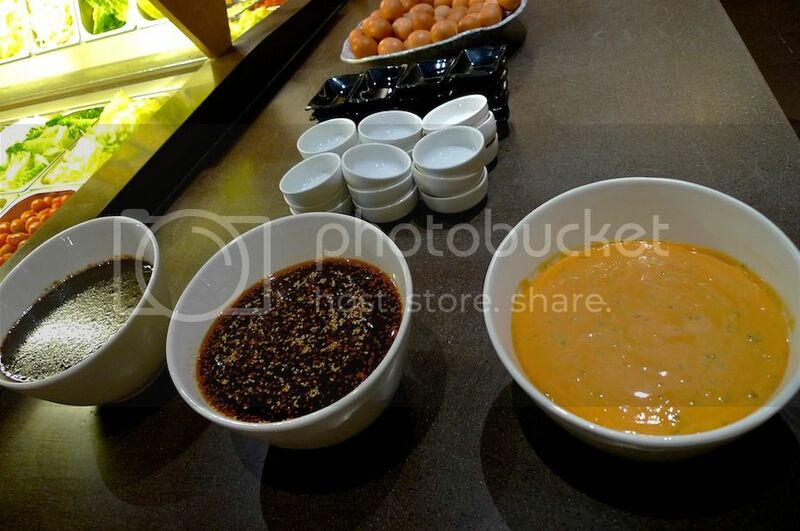 Each person is given 2 special sauces - I do not know the names but I love them especially the spicy one on the left! Dipping your cooked meat into this spicy sauce will make you want more! 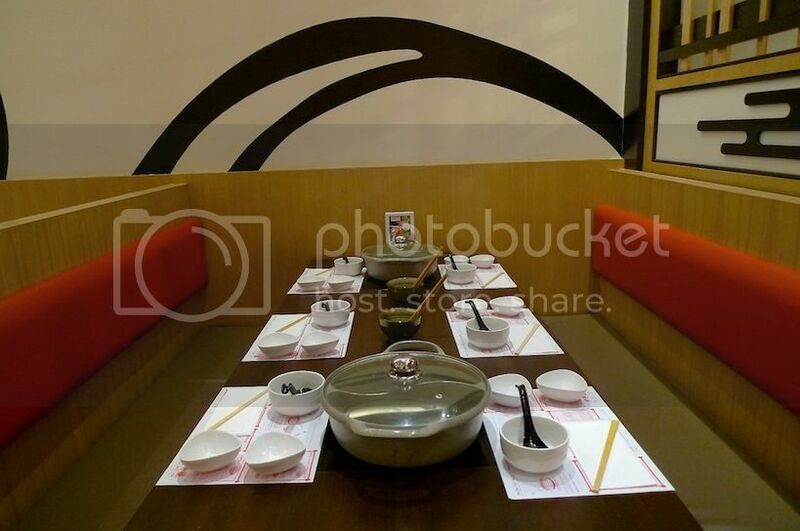 Eating here is never boring as you can choose to dip your meat in the many variety of sauces and also in the raw eggs. 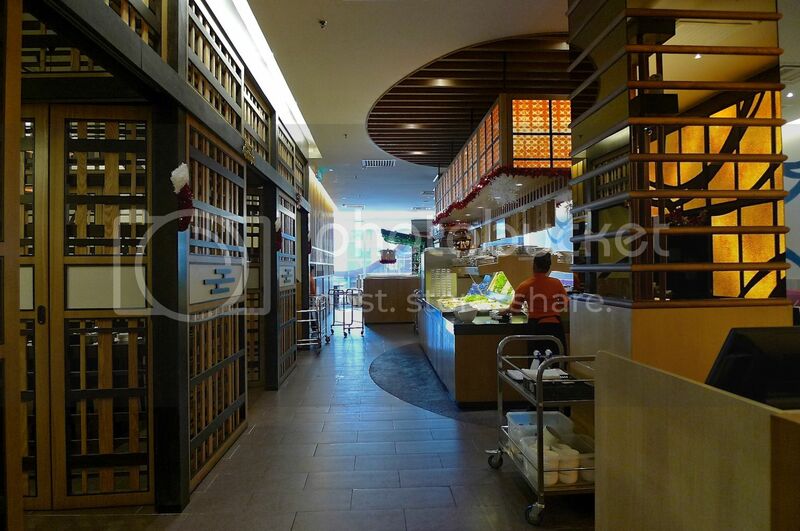 Priced at only RM29.80 for buffet lunch and RM39.80 for buffet dinner (children below 12 eat at half price), I thought dining here is well worth your money! The only downside is your dining is limited to 2 hours - they charge RM3.50 for every 15 minutes thereafter. Despite this rule, I had eaten more than 2 hours here before and they did not charge me for the extra time so I am not sure how strictly they follow it. 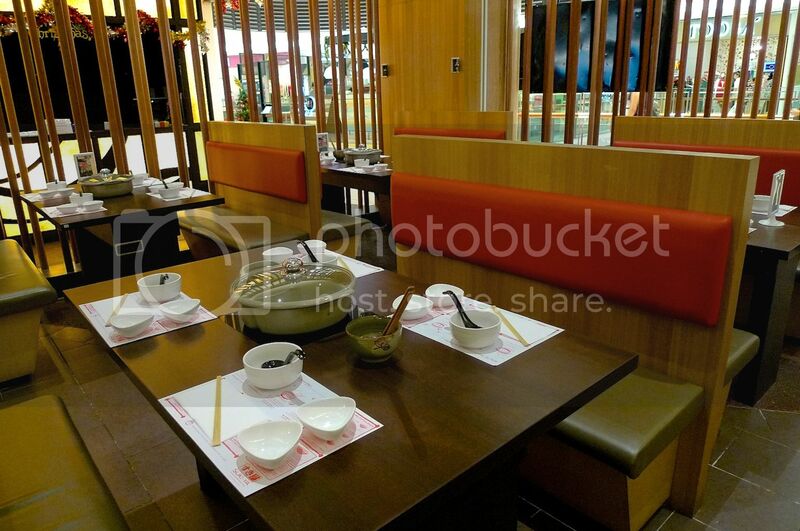 Green tea is free flow and is included in the buffet price. Other drinks are chargeable. Lastly, do not forget your desserts! Suki-ya offers ice cream in three flavors - green tea, chocolate and roasted rice. You can eat the ice cream in a cone or in a cup, with toppings too. 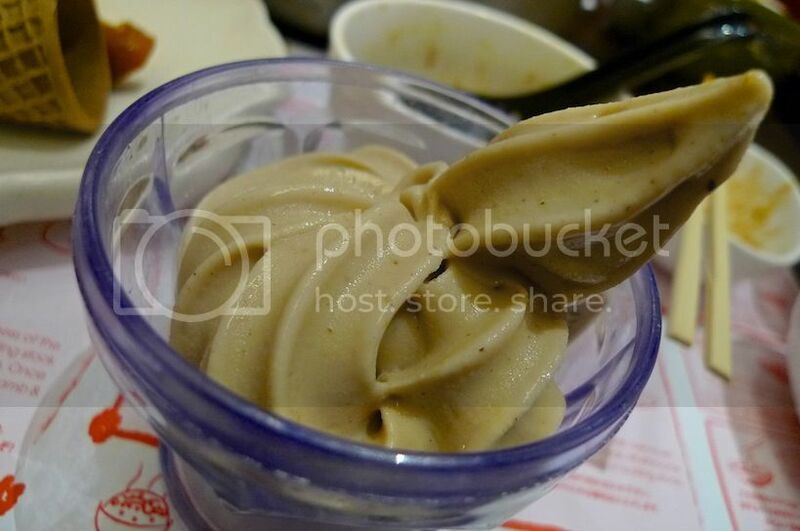 My cup of plain roasted rice ice cream. Yum! 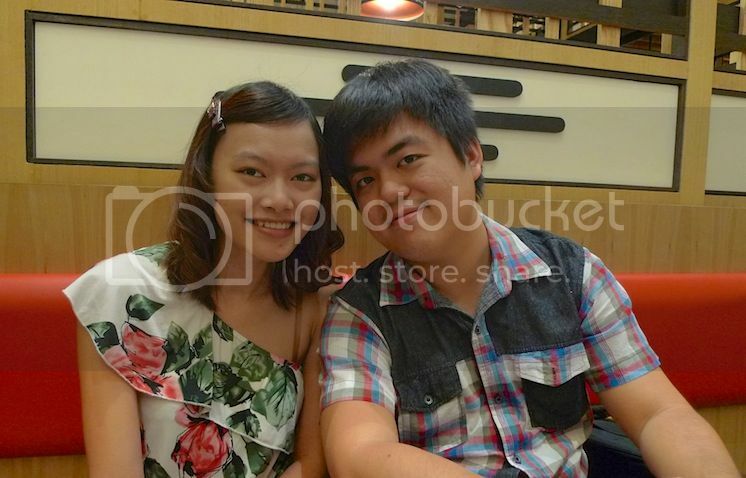 We had a great time at Suki-ya that day. For more information on Suki-ya, check out the Suki-ya website. Guess who were the blogger friends I had lunch with that day? They were Caroline and Eric. Saucer (does he even blog anymore?!) and Witch - both of them came back from Australia for a holiday! Great to see them again! 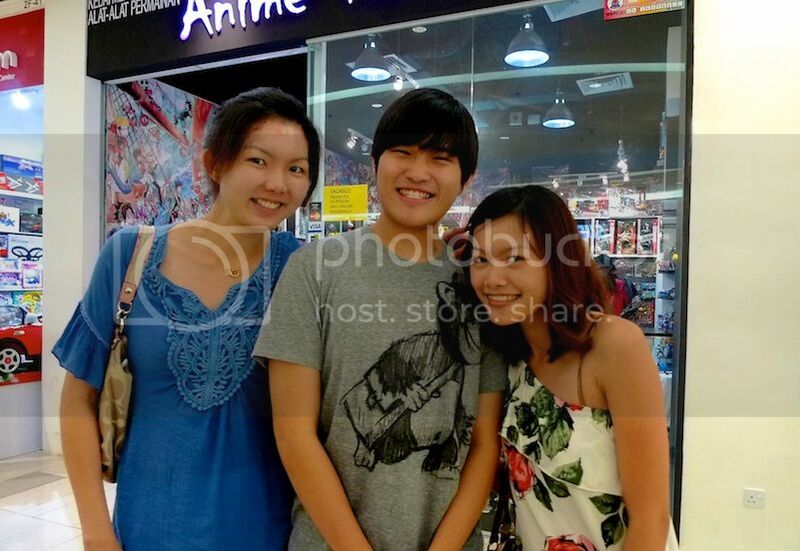 Grey (ex-blogger) did not manage to join us but we met him briefly later inside Paradigm Mall. The photo below shows Grey posing in the middle of Witch and Caroline. Naturally, I am not in any of the photos. Haha!